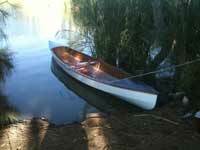 Great to hear you are building a Tahoe 23. I think the trick is to read lots of the forums and see what others have done. I think also the layout depends on what you want to use the boat for. For us it is waterskiing and I also wanted to be able to access the front seats from the back walk thru style, rather than climb over a central cross beam. I then needed to have rear facing ski observer seats so came up with the fold down seats idea. I was a little bit anxious when I decided to go for a painted finish vs. mahogany, and again when I chose the colour but wow, if I say so myself!!!! Holy cow that looks stunning. Congrats Dave. I recently painted my canoe with a similar scheme as an experiment to see if I could finish off something larger. I'm still undecided but your pro job really shows. Like you I've decided to paint my boat and I too have had anxious moments. But seeing your beautiful boat makes me feel much better about it. I espcially like the wood trim edges around the blue. I say "wow" too Dave! Thank you for the feedback, working on the boat this weekend so will post some updates later. We put the hardware in place, just got to seal the holes. I started the wiring but it's a bit tricky when say a section can't be mounted as a bit of the frame needs to be cut, or a bracket made...I think I'll pre-wire the switches and fuse block area which will speed things up. Gauges are in (temporary still) so is looking good. Wow!! That looks great! Cant wait to see her completed. She'll be a head Turner for sure.